Having worked for a couple of years at a bead and yarn shop, I have a soft spot for sock yarn with great colors. So, when I got a recent yarn catalog and saw the below, I was in love. Now, I don't have a huge yarn budget. In fact, I don't have a yarn budget at all, but I allocated some of the funds I earned at my last art show for this, ordered it, and waited anxiously until it finally arrived at my doorstep. The soft white package in my hands, I was SO excited to open it and see the beautiful colors! Now, maybe it's just me, but I think that looks totally different than advertized. Let's take another look. Now, maybe i'm crazy, but they don't look the same to me. At all. So, I sent an e-mail to the company's customer service. Sock yarn isn't inexpensive and if they send something different than what they represented ... well, then I want all of my money back - including shipping. Thank you for writing. Macaw has evolved a little bit from how it was first dyed, the colors are a little more separate, but the first picture does not indicate a fuchsia. It sounds like the calibration may be off on your computer. 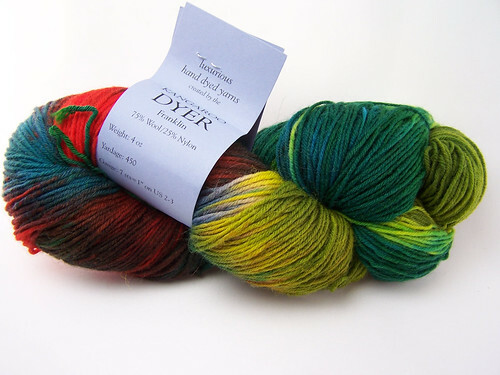 We will make an exception and refund your return postage for this yarn when you return it. In future, please do give us a call if you need any clarification, or have any concerns, especially with hand dyed yarns! We are always happy to help. First, is it my imagination, or did the customer service agent imply it was my fault for both not remembering exactly what fuschia looks like (which, in my mind I grant you, is a broad amalgamation of anything in the neighborhood of a bright blue-red-pink) and not calling and checking to confirm that the product actually matched the photo (really?! you're supposed to do this? ), AND do both of these first before saying that, yes, they were very sorry for the mistake and they would generously cover shipping. Oh, no - my mistake. She didn't apologize. Second, if a product that I sold - a product sold and marketed based on its colorway - had evolved and I didn't change my photos, how would you feel as my customer? How is this okay to do, much less give as an implication that I should be okay with the discrepancy ... sorry, "evolution". Would it have made a difference if I had referred to it as magenta or Bittersweet rather than fuchsia? I honestly don't believe that you can explain it away as the calibration being off on my computer when, on my computer, and now on yours, the colors still look different. Might my camera be broken and totally fail to adequately capture color? Maybe. But, then, I've never had a customer complain that the color of the product they received was different than what I represented online. And the color on the skein that I saw with my eyes and subsequently captured with my camera looks the same as the color on the monitor to me. Same camera. Same computer. Same eyes. I realize that a different person with a different camera took the original catalog and web picture than the picture of what I actually got, but if different cameras really took such disparagingly different pictures of what was supposed to be the same thing, then we wouldn't use them for web commerce because we wouldn't be able to trust them, right? I mean, I'm about to do an art charm exchange and I took pictures of the charms I received, and if you them looked at the pictures the original artist took, you'd expect them to look really, really similar, right? On Friday's reveal, the proof will be in the pudding. So, am I mistaken, or does that mean that the only thing left to explain the difference in colors is, well, a difference in colors. So tell me honestly. 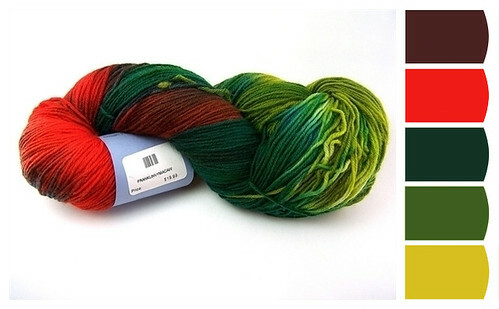 Are the colors from the online swatch the same as the skein I received? Would you have been happy with what you got? What do you think about the response I got back from the customer service agent? I did get the shipping refund I asked for (only the shipping I paid to receive it, not the shipping I paid to send it back). I am grateful for that. But, given the business I'm in, which is similar in many ways to the business they're in, I wonder about the standards of product representation and customer service they're operating on. Am I in the wrong? Are they? Or, is there something in the middle that I'm overlooking? You were not a happy customer. Can't say I blame you either. Evolution indeed. 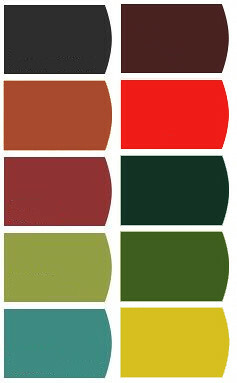 I hate trying to figure out colors on line- there are too many variables. However, the pictures you have posted are a huge change. The yarn you received is brighter and closer to the primary spectrum, the original picture is within the family but more muted and toned down. That was not very good customer service. Thanks, KJ. I'm relieved to know it isn't just me being crazy. The catalog picture looked identical to the online image on my computer, so I didn't imagine it would look like anything else :( It would have been so pretty!